Late evening fairly busy as expected for this popular drinkers pub. We could've stayed around half hour longer had we known the train service was disrupted prior to our departure. Lunchtime- my faith in this pub is restored. A pleasant couple of pints enjoyed with the soft hubbub of conversations ongoing around the bar. Canterbury Brewers - Mosaic 4.70 Delicious - great body. Pig & Porter - Sky Without Sun 4.50 Strange name - I half expected this to be cloudy (geddit?) but it was clear and very palatable. Badged as an American Amber ale. Early evening - quite busy - but after an excellent pint I waited for 5 minutes to be served - landlord mainly preoccupied with his parcel business sideline - so I left. Was a 4th beer from Exmoor on - Exile Apollo chalked up on pump clip. Angels & Demons (also uses McCanns branding) - The Second Coming 4.50 A very well crafted IPA in top condition. Early lunchtime- the pub now also serves as a delivery depot and I had to pick up a package. Would have been rude not to have a drink as well. Good beers and an interesting chat with a couple of regulars - they said it was the first time they had seen anyone picking up a package and having a drink there. Salopian - Oracle 4.00 Superb flavour, in excellent condition. Whitstable - Pearl of Kent 4.50 Smooth with a good body. Mid afternoon - warm ambience, comfortably busy. Look to be a bit more adventurous with their beer selection today. Whitstable - Bullion Best 4.80 Green hop version, very pleasing. Boutilliers - Sleep Delays 3.10 Not Tried Odd name, low ABV - I really should have sampled this. Evening, a gentle buzz. More adventurous selection of beer on - but slightly irritatingly they have dispensed with traditional pump clips and replaced with handwritten chalk-on-slate clips that are difficult to read. Hopdaemon - Red 4.20 Not a type of beer I tend to go for - but this was delightful. I was surprised to see such an interesting range of beers on tonight, some of the customers were bemoaning the loss of their usual stuff so it may come back. 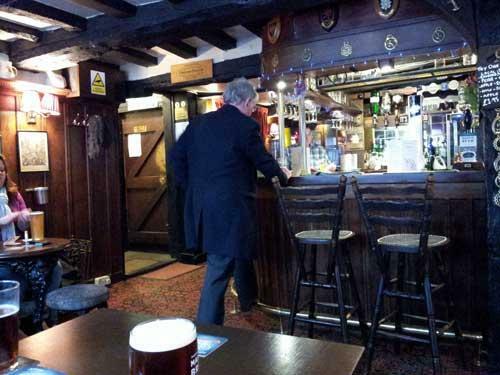 Friday evening - splendidly busy (about 50, mainly drinkers, in) and very welcoming after my 2 mile walk through the snow. Purple Moose - Cwrw Eryri (Snowdonia Ale) 3.60 A good, fresh, tasty beer. No idea how to pronounce it though. Evening - good crowd of mainly mature drinkers in. Kent - Prohibition 4.80 Delicious. 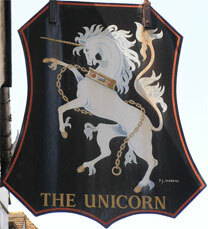 The pub is found in Canterbury, Kent, CT2 8BS. 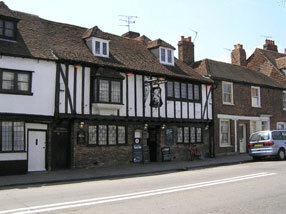 Tudor style, low ceilinged pub with U-shaped bar counter which is close to Canterbury West railway station. A corridor leads to the toilets and then a well appointed garden. Good selection of beers and a cider served in good condition. 5 handpumps. CAMRA Canterbury, Herne Bay and Whitstable Branch Pub of the Year 2014. We have visited this pub 67 times, seen 75 different beers and tried 50 of them.